It’s hard to believe it’s been 10 years since Hospice House, nestled on a quiet corner of Ethel Street, opened its doors to provide a place of solace and support for those in their final stages of life. The cozy 24-bedroom house sits alongside Mill Creek, and extensive gardens brighten residents’ and visitors’ days. But the heart and soul of the Hospice House is really in the people who work there and the compassion they offer those in care, and their families. “My mom spent her final days at Central Okanagan Hospice House. We cannot say enough good things about the care she and our entire family received during this difficult time and it is a memory we will hold with us forever,” says Peggy Collie, whose mother, Jean-Margaret Seabrook, passed away in hospice last fall. Hospice House was built 10 years ago after the KGH Foundation led an ambitious $3-million fund-raising campaign in the community. The Hospice House was built on Ethel Street near Springfield Road on what was the old Bennett homestead property. In fact, the Bennett family would become generous supporters of the campaign to build a free-standing hospice house when Brad Bennett was Chair of the KGH Foundation, and his wife Birgit was a volunteer for the Central Okanagan Hospice Association. As the lead fundraising agency for Hospice House, the KGH Foundation is grateful for the continued support of the community. 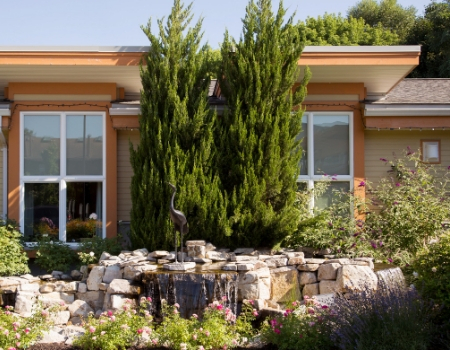 “We are constantly inspired by the amazing work at Central Okanagan Hospice House. We are honoured to receive gifts from grateful families and know that every single gift tells a story,” says Doug Rankmore, KGH Foundation CEO. Hospice palliative care focuses on improving quality of life and alleviating suffering, and is most often provided in people’s homes as well as in free-standing hospice houses, long-term care facilities, and hospitals. The Palmer Family At birth, she weighed only 2.6 lbs. She has been in and out of the hospital ever since.